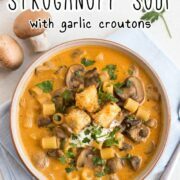 A simple, flavourful soup inspired by my favourite mushroom stroganoff! 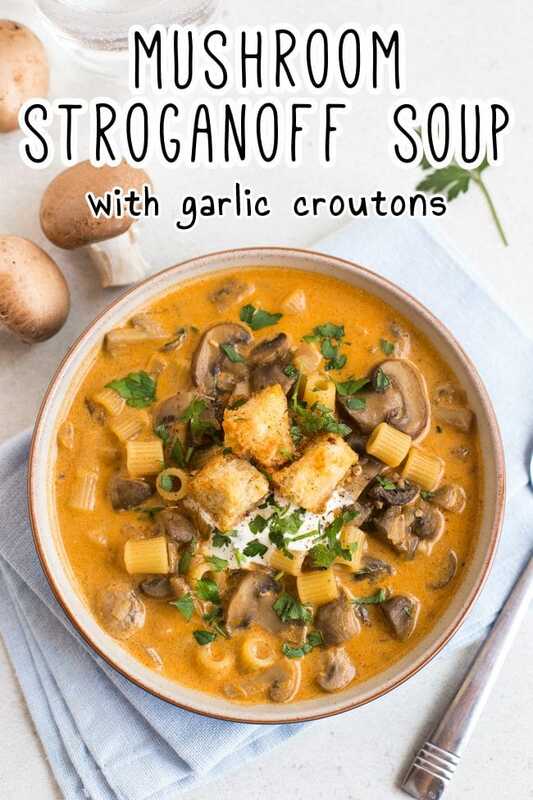 This soup couldn't be easier to make, and goes beautifully with crispy homemade garlic croutons. You may have noticed that mushroom stroganoff is one of my favourite ever meals. 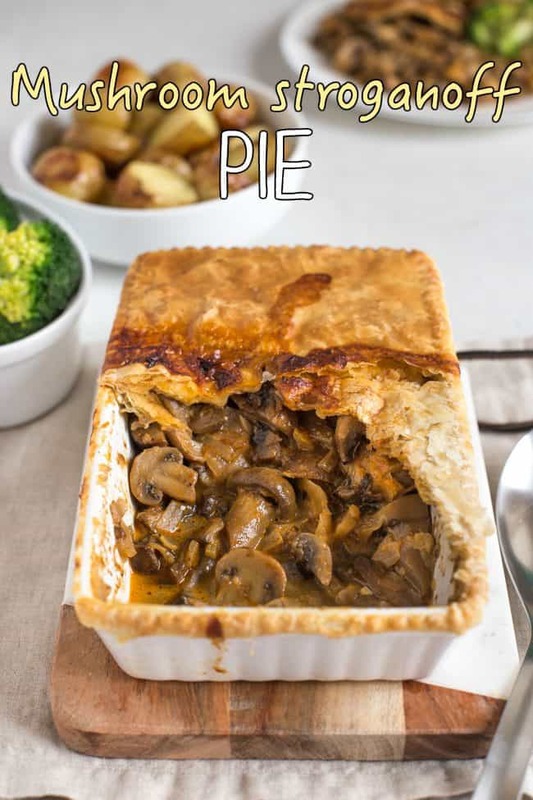 I’ve shared it here not once, not twice, but 3 times, in various forms – once as a super quick 15 minute version, once in the slow cooker, and once as a pie! It’s so easy to make – just a few simple ingredients make such a flavourful dish. But I’ve still not quite had strogenough (…no? ), so this time I’ve reimagined it as a mushroom stroganoff soup! It might seem like a strange time of year to be sharing a soup recipe (I hate to be ungrateful, but will this hot weather ever just go away?! ), but this mushroom stroganoff soup actually makes an amazing summery meal. It’s creamy, but isn’t super thick, so it still feels light enough to enjoy in the heat – and with plenty of garlicky mushrooms and some little pasta shapes, it’s filling without being heavy. The perfect in-between! I will definitely be making this mushroom stroganoff soup again in the winter, though. It was delicious in 30 degree heat – which is about 86F to y’all American folk (…did I use ‘y’all’ right?) – but it would be just as amazing as a cosy winter dinner. 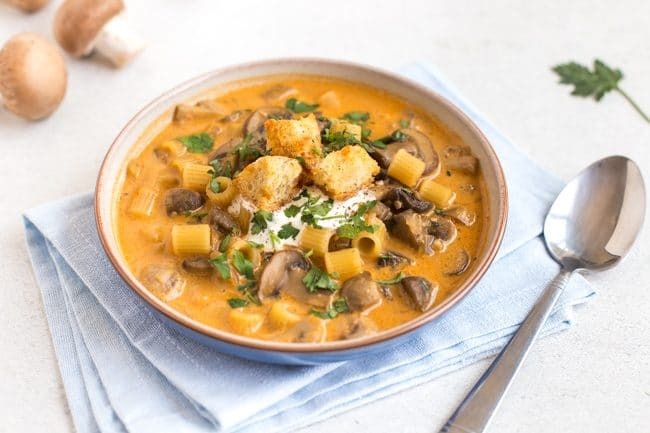 What’s in this mushroom stroganoff soup? The soup itself is super simple (really resisted the urge to write ‘souper’ there, lest this post turns into some kind of pun free-for-all). It’s got mushrooms cooked with onions and garlic – always an amazing place to start any recipe – and plenty of smoked paprika, my favourite. The little pasta shapes are reminiscent of the way stroganoff is often served, and help to turn a light soup into a full meal. And the sour cream makes it all creamy and delicious! 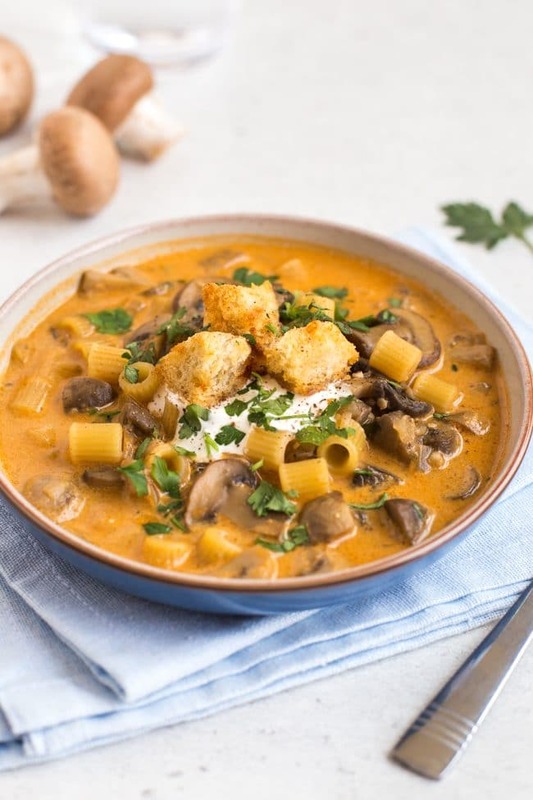 I just added a bit more veggie stock than usual to make it soupier than a classic stroganoff – feel free to adjust the consistency however you like. … and that’s pretty much all there is to it. Stroganoff is so simple, and uses so few ingredients, but it’s so effective. Definitely a recipe after my own heart – maximum effect with minimum effort! 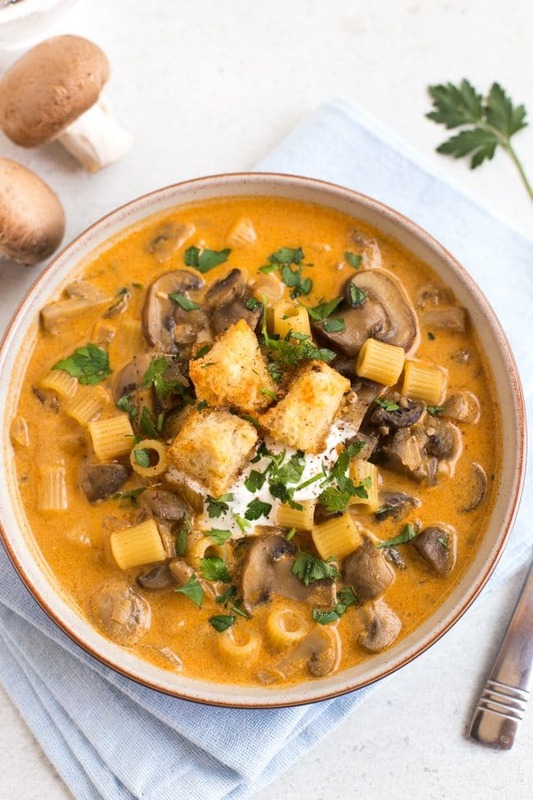 As with most soups, this mushroom stroganoff soup is really brought to life by the toppings (I’m all about the toppings lately)! Fresh parsley is a must, for colour and freshness, and an extra dollop of sour cream adds a little luxury. Then you just need a few crunchy homemade garlic croutons! If you’ve never made your own homemade croutons, you’re missing a trick – they are infinitely better than the shop-bought version. Just chop up some crusty bread (I used a bit of baguette, but anything will work fine), toss it in garlicky melted butter, and bake until crispy. So easy, so delicious. And there you have it! Chuck it all in a bowl, and dig in. Heat a dash of oil in a large pan, and add the onion, garlic, and mushrooms. Cook over a medium heat, stirring regularly, until the vegetables are soft - probably at least 5-10 minutes. Add the smoked paprika, and cook for 1-2 more minutes. Add the vegetable stock and pasta shapes, and bring to a gentle boil. Cook until the pasta is soft (another 10 minutes or so). Meanwhile, prepare the homemade garlic croutons. Add the minced garlic to a small, microwave-safe bowl, along with the butter and olive oil. Microwave on full power for 30-45 seconds, until melted. Cut the bread into chunky pieces, and toss thoroughly in the garlic butter. 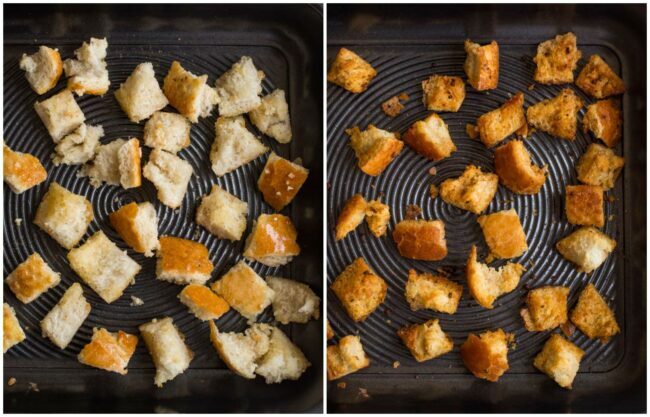 Spread the croutons in a single layer on a baking sheet, and season generously. Bake at 190°C (Gas Mark 5 / 375°F) for around 15 minutes, or until golden brown and crispy. When the pasta has cooked, turn the heat down low, and add the sour cream. Stir the soup until the sour cream is well mixed, and season generously with black pepper. 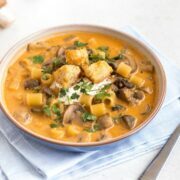 Serve the mushroom stroganoff soup with an extra dollop of sour cream, plenty of fresh parsley, and the garlic croutons. If you can't decide whether you'd prefer to slice or dice your mushrooms, do a bit of both! It will add a more interesting texture to the soup. Note: Nutritional information is approximate, and will depend on exactly what ingredients you choose. Information above is for 1/2 the recipe, including croutons. Well I’ve just made this for the 4th time, actually made the croutons this time too, with the addition of a wee bit of parm because why not, right? Still managed to get the smoked paprika quantity wrong though, I make a single serving just for me, and I put a tbsp of it in rather than a tsp, oops! As it turns out though, best mistake ever! I use wholemeal pasta which is a bit of a flavour vampire though this has never been not tasty, but this time it was, to quote you, flippin’ delicious! I made this last night. It was MAGICAL. I’m a rubbish photographer, so my efforts didn’t match the wonderful looks of your soup, and I won’t be adding my creation to Instagram, but it tasted great! The croutons were certainly amazing. I served it with brown basmati/quinoa, which I spooned the soup over. Yum. Will definitely make it again. Thanks! I made this last night….when I heat up my bowl each evening this week I will stir in the sour cream…I wasn’t sure how it would fare through the week… I will take a pic tonight and you can see how it turned out!! Loving the look of this, sounds just the perfect dish for cold autumn days! Thank you! The weather is on the turn here so I’ll definitely be making this one again soon! This looks so delicious, I would totally love it! I love soups any time of the year, not only in winter. Thanks Petra! I do too, just nothing too heavy!